Now that it finally feels like spring here in Fort Collins, my craving for iced coffeehouse beverages has begun. I’ll be spending my first summer here while I work and take extra classes, (maybe intern as well), and I’ve already begun experimenting with caffeinated iced drinks to get me through my 7:30 a.m. typography class in June. My first experimentation this season: an iced dirty chai. 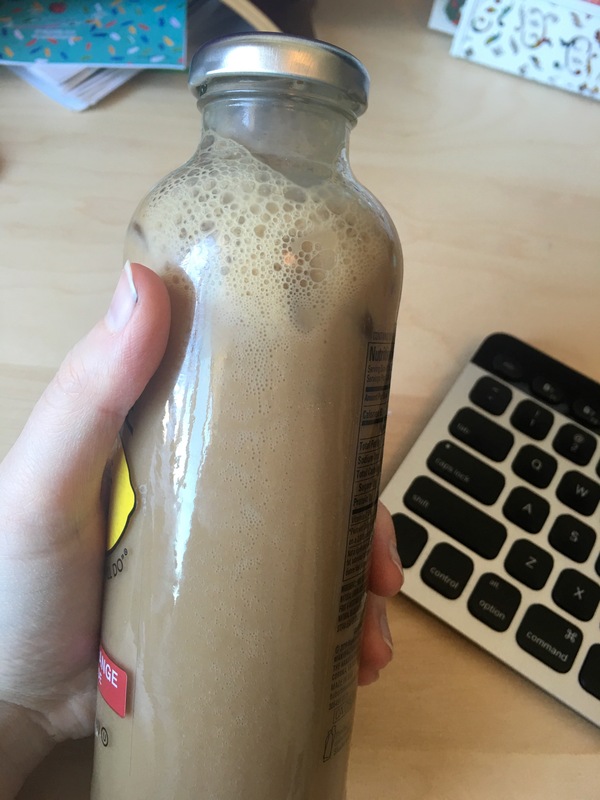 What makes this chai “dirty”? A shot of espresso— that’s where the caffeine boost comes in. I bought the powdered spicy chai mix from Trader Joe’s on Thursday. I chose this mainly because it will keep the longest and was the cheapest. Another alternative would be a chai concentrate, (also available at TJ’s or your grocery store), which is what most cafés seem to use. To make the iced chai, I follow the instructions on the package. A scoop of chai, 2 ounces of hot water, 2 ounces of milk. Combine the chai with the hot water, then pour over ice and add the milk. I’ve been using cashew milk lately because it lasts longer, but also because it’s so creamy and rich that you wouldn’t know it has fewer calories than almond, soy or dairy milk. Now for the boost — espresso. I happen to have a Nespresso machine, the Delonghi Lattissima Plus to be exact, which has now been discontinued by Nespresso (which means it’s on sale everywhere else). The most similar option in the newer line is the Delonghi Lattissima Touch. So for the “dirt” in my dirty chai I just popped a Nespresso pod in and brewed the espresso right over the ice. Obviously, this isn’t an option for most people, so I’m experimenting with other methods as well. While the store-bought is a good deal, I didn’t really want to spend any more than I had to on this trip to the store, so I’m making my own. I found a simple recipe from Bon Appétit and rinsed out a 59 oz juice jug. The recipe calls for a half pound of freshly ground coffee, but I just used a cup of a ground French roast that I really like that’s only $10 for a 2lb bag. Then I just filled the rest of the jug with cool water, gave it a shake, and let it sit for 12-16 hours before straining it. It turned out well, and now has its place in my fridge! For a dirty chai I add about a third of a cup of the cold brew. More to come in terms of iced coffee later!